Pep Guardiola is not returning home atop an army of elephants like Hannibal but at the head of a field hospital. This is not how he imagined it. The Camp Nou is his home, Barcelona too. It was there that he learned, there that he became a man and it is to there that his thoughts are often drawn. Send him a photo of the festival of Sant Jordi, the patron saint of Catalonia, when roses and books fill the streets, and the emotion washes over him. “Tell me all about it,” he says. So you tell him. You tell him how people talk about him still, about their affection for him. How they gather at the book stalls that spring up all over the city to read about him, how they ask after him at signings of Pep Confidential. “Tell Pep we still love him here,” they say, the same line repeated often. It was inevitable that Guardiola would face Barcelona one day. He could sense that it was coming in the Champions League. He decided to prepare himself for it by going to the Camp Nou in March, witnessing Lionel Messi’s destruction of Manchester City in person. Accompanied by his father Valentí and his friend Manel Estiarte, he parked some distance from the stadium and walked the rest of the way along with the fans, just another supporter going to the game. Then he took up his seat, with his season ticket. He killed two birds with one stone. He scouted a future opponent and allowed all the emotion to come to the surface, returning for the first time since departing as coach. Over the last few days, many people have asked how Guardiola will feel. He found out, in part at least, on 18 March. If he came to the Camp Nou that day, it was to pre-empt those emotions, to somehow get ahead of them and not be caught out by them, like a patient going to the doctor for a vaccination. He will not be immune on Wednesday but he will be prepared. Guardiola is forever preparing. His personality is at once rational and emotional. He prepares games with his head but lives them with his heart. He is cold, analytical, meticulous and calm when he dissects opponents, searching for possible weaknesses. But he is passionate, emotional, exuberant, volcanic even, during the 90 minutes. He suffers like anyone else, swinging from enjoyment to anger, nerves to laughter. He is adept at reading the game, analysing what he sees rationally, but at the same time he has been sent off more times than any other Barcelona player in history: eight times he has seen red but never for a foul, always for vehemently protesting what he saw as an injustice. Reason and passion go together within him but this time he is confronted by a serious problem and he will need imagination to overcome it. Bayern Munich are a walking infirmary. His best players have dropped one after the other. Victims of the way he works? Not exactly. There have been only six muscular injuries all season, less than half the average for elite teams, according to Uefa. It is not the training that has provoked this catastrophe, instead, misfortune has multiplied. The majority of the injuries have been caused by clashes with opponents, bad challenges and tackles that have torn ligaments. It has been so bad that it is not just bodies that have been broken but records too. In every minute of the season, 25% of the squad has been unavailable, at least six players every day. Worse, Guardiola has been in charge for 677 days and not one of them has been injury-free. Adversity has changed him. He is less naive than he was, more mature. That change has been beaten into him. In Germany he has discovered new nuances too, different tactical challenges. Opponents have counterattacked relentlessly, encouraging him to seek new tactics, new means of prevention. He has become more direct in attack and has focused greater energy on defensive efficiency and organisation. Bayern won the league having conceded just 13 goals in 30 games – 0.43 goals conceded per game is the best figure of his career. He is more mature as person too. He knows that he still makes mistakes, that his character can come through, his emotion uncontrolled and expressed in confrontations with referees or with others. Few results have taught him more than the painful defeat to Real Madrid last season. That day, he got his planning wrong; tactically, he failed. The team collapsed. He took full responsibility, even that which was not truly his. In doing so, not only did he learn a lesson, he also brought his players closer to him. His public acceptance of blame engendered loyalty and gratitude. Guardiola has changed Bayern’s footballing language. A team that was already formidable plays differently now. His players have been intelligent and modest. Instead of clinging to the treble, they embraced the idea of learning a new identity. Their apprenticeship in a positional game has not been easy because it is a complex system. That was why Guardiola insisted from the start: “Thiago oder nichts”; Thiago or no one. He was to be the player that held the new model together. Bayern’s problems over the last two years must be analysed through the 426 days Thiago has been absent through injury. Bayern speak Guardiola’s language now. The players understand a variety of systems and tactical shifts, nuances that most barely see. They can move between them within any game, barely breaking stride, and every player has reached one of the key objectives that Guardiola set: to be able to play in two or three different positions depending on the team’s needs. Rafinha at left back, Philipp Lahm at right wing? Fine. They must all know how to play different roles. 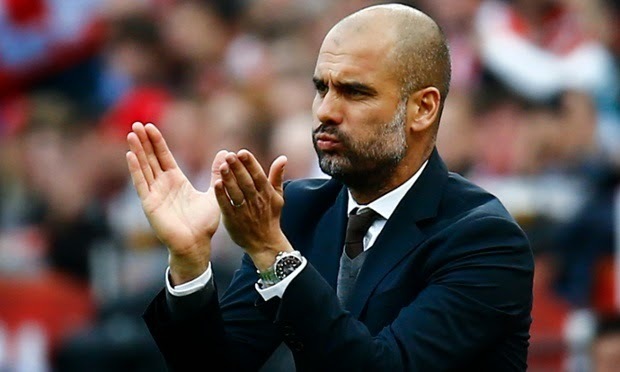 It is not easy to understand Guardiola because his thinking is far from conventional. If you try to judge his style within the traditional parameters of the game, through a definition like 4-3-3 or a 4-2-3-1, the analysis will be incomplete. Before each game, the formation appears on TV screens but it does not help you understand what Bayern are actually doing; it explains little. The players, though, do understand him because they have learnt to. “Pep explained the weaknesses of Roma to us exactly. We knew precisely what we had to do,” Thomas Müller said after Bayern had won 7-1 at the Stadio Olimpico. They understand the language now, but it is true that those who interpret it best, who express it most clearly, are unavailable for Wednesday. Arjen Robben, Franck Ribéry, David Alaba, Holger Badstuber, perhaps Robert Lewandowski. Barcelona, not Bayern, are thus the clear favourites to reach the final in Berlin. The Guardiola that returns home is different to the one that departed in 2012, even if the essence of him remains the same. He is more mature, yet more aggressive. He is more defensive in his approach, something which those who look at the game superficially find incomprehensible.